I sometimes feel I’m living in the home of the rainbow. By accident more than design, I happen to live where the morning sun meets the mountain mists. Particularly in the cooler seasons, when clouds hug the mountain’s flanks and the rising sun projects straight up the avenue, rainbows are an amazingly regular phenomenon. I think of rainbows as a classic case of science meets poetry. The science, first described by Descartes in the 1630s, and later refined by Isaac Newton, seems as eccentric as any poem. The essential explanation is that when sunlight meets a water droplet, it bends as it enters the droplet, reflects off the back of the drop, then bends again as it exits the drop. As different parts of white light bend (refract) at different rates, the rays are split into their component colours, splaying like a deck of cards: red on top and violet on the bottom. That makes a rainbow a display of light that’s been bent, bounced and re-bent: measurable, predictable, beautiful. The weirdness doesn’t end there. A rainbow is actually a complete circle: the top rim of a cone of light. The observer stands at the narrow point of the cone looking top-ward. But because most observers are on the ground, they only see a part of the circle, as though the cone is partially buried. Aeroplane passengers and mountaineers often report seeing the full circle, as there is no ground to interrupt the full display. A circle, by definition, lacks a beginning and an end. So you’d imagine this lack would kill off the legend of a pot of gold at rainbow’s end. Add the observation that as you travel toward the end of a rainbow, it keeps moving ahead of you, and you’d think the hopelessness of the chase would be irresistible. Yet somehow the science never quite buries the romance. Being a hopeless romantic, I once took our (then) young children out to look for the end of the rainbow. We wandered up the valley, rugged up against the cool, moist, morning air. A fresh rainbow had formed just up valley, and we wanted to get amongst the treasure. Our eldest daughter Sally decided to run ahead, quickly followed by the others. At one point the rainbow seemed to enclose us all. Excitedly Sally called out that she was at the end of the rainbow. “It’s right here! Come and see!” But Stuart, who was some twenty metres back, called out that, No, HE was at the rainbow’s end. Not to be left out, Heather and I were sure that WE were right in the middle of the rainbow. As a father I know that you can’t always please everyone. 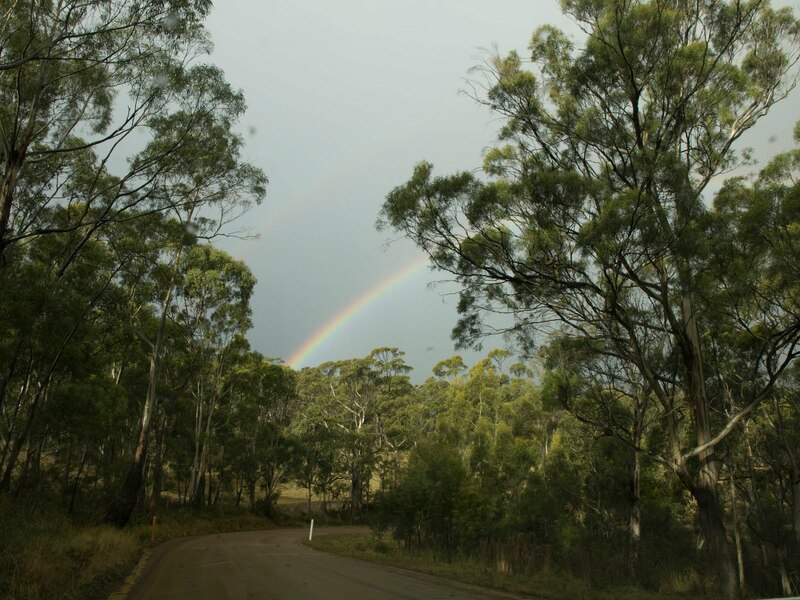 But I’m glad to report that at the end of our mini-expedition, we were all able to say, with equal scientific accuracy, that we had each been to the end of our own rainbow. My justification for that bold statement is that a rainbow really ends in the observer’s eye. The projection of light that is a rainbow is seen uniquely by each person observing it. Each falling water drop actually flashes its colours to the observer for just an instant, before another drop takes its place. And that makes the show subtly and uniquely different for each person seeing it. If that isn’t a treasure, I’m not sure what is. Maybe that’s why there are so many songs about rainbows.